South Korea's leader says Pyongyang risks a regional "nuclear domino" effect if it makes good on its threat to detonate another atomic device. "North Korea would effectively be crossing the Rubicon if they were to conduct another nuclear test," South Korean President Park Geun-hye said in an interview on Wednesday with the Wall Street Journal. Pyongyang in recent months has made repeated threats that it is prepared to conduct a new kind of atomic test. Independent analysts have speculated this could mean the North for the first time will detonate a device fueled by highly enriched uranium or might simultaneously explode multiple devices. The isolated state has already conducted three underground trials, and experts believe the next possible test could significantly advance the Kim Jong Un regime's progress toward producing miniaturized nuclear warheads. 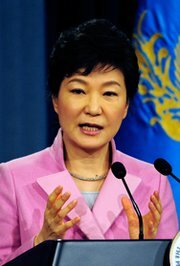 Park said there would be a "huge impact" on the East Asian security climate were the North to conduct its fourth test. "It would be difficult for us to prevent a nuclear domino from occurring in this area," she said. Both Japan and South Korea have advanced civilian atomic energy sectors and both have restive minority political parties that occasionally urge their respective governments to develop nuclear arms in response to the rising threat from North Korea. Meanwhile, a U.S. House panel on Thursday passed legislation that would tighten national sanctions against North Korea by seeking to prohibit its ability to obtain foreign hard currency, the Yonhap News Agency reported. The "North Korea Sanctions Enforcement Act" is aimed at giving the U.S. government "the tools necessary to sanction third-country persons and banks that facilitate North Korean proliferation, smuggling, money laundering, and human rights abuses," states a House Foreign Affairs Committee press release. Committee Chairman Ed Royce (R-Calif.), who sponsored the legislation, said it would "apply the same type of pressure the Treasury Department successfully applied in 2005, when it targeted a small bank in Macao that was complicit in Pyongyang's counterfeiting." It was not immediately clear what the bill's prospects are for coming up for a House floor vote, or whether the Senate will move to take up the legislation ahead of the mid-term elections, Yonhap reported.